YouTube is now the second largest search engine in the world and over 3 billion hours of video are watched on You Tube every month. Over 90% of online search results are for videos or include video content. There’s no doubt that videos are the way of the future, and that more and more content is going to be delivered via video. Video won’t replace written (or audio) content, but it will amplify, augment and complement it. If you aren’t using video now, you need to be thinking about, and planning for, video content somewhere in your near future. If you want to connect with your audience and show them audience that you understand them and their unique challenges then a well crafted, compelling video will do that for you like no other medium. If a picture says 1000 words, then a video must say 10,000 or more. Great videos – compelling videos – don’t happen by chance. They happen through strategic and creative planning and thinking, the identification and application of an effective process, and through creative preparation and great project management. The combination of these three skills is rare to find. You need to meet the commercial and corporate objectives for your video and you need to produce a creative and inspiring video that’s going to engage. And this is where I come in. Through my background in project management, process identification and execution, and strategic thinking (the commercial/ business side of things) combined with my experience in the media and my creative skills, I can help you create a unique and high quality video that will meet your corporate objectives and be compelling to watch (and will be something others want to share). I can help you with the end-to-end process of scoping out your video through to preparing for it, filming and editing it, and completing the final video. I work with a range of world-class professionals who have technical skills (such as filming, editing and post production) to provide you with a one-stop package, and we work together to create an outstanding video that will meet your commercial needs and be compelling to watch. Don’t leave your video project to chance! Creating a compelling video is not a random event and there are key steps, strategies, and yes a few secrets, to it. 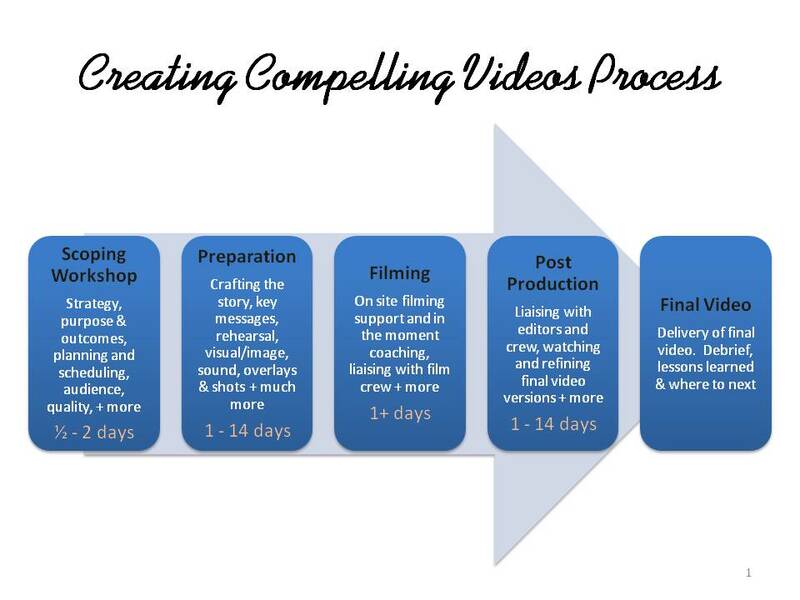 I can guide you through the process and help you create a compelling corporate video (or video series). If you want to connect with your audience, show your audience that you understand them and their unique challenges, and demonstrate your expertise and experience then a well crafted, compelling video will do that for you like no other medium. Contact me today to start your compelling video project!